In this article, we mainly discuss how to recover deleted or lost EXT4, EXT3 and EXT2 files & partitions in Windows 10/8/7. Files stored on Linux partition might get lost due to accidental deletion, system crash, disk formatting, hard drive issue, etc. and you need to know how to get back lost data or partitions no matter which operating system or platform you are using. Here we introduce reliable Linux data recovery methods to help you get back deleted/lost Linux files and partitions. DiskGenius - Safe Linux data recovery software to recover deleted files from EXT4/3/2 drives in Windows. Guide 1: How to recover deleted/lost files from EXT4/3/2 partitions? Guide 2: How to recover deleted/lost EXT4/3/2 partitions? The popularity of Linux operating system keeps growing and it is used by thousands of business and PC owners. Nowadays, the most popular operating systems from Linux family are Ubuntu, Knoppix and Fedora. Linux is widely used mainly due to its open source code, which means users are allowed to modify and redistribute the underlying source code in either commercial or non-commercial programs under the General Public License. Distributions covers kernel (Linux central component) and supporting libs and utilities. Linux system uses difference types of file system, such as Ext2, Ext3 and Ext4. Though Linux is excellent operating system, it is not able to escape data loss issue. Files stored on Linux partitions might be get deleted or formatted, partition can turn to unreadable, or Linux partition may get lost for some reason. Losing important data can be a painful experience in this digital world. To avoid data loss issue, we are often advised to back up data and keep multiple backup copies. However, only few of us realize the importance of data backup. Many of us never has a recent backup and have to face data loss issue. Fortunately, there is no need to be despair now, there are a few things you can try to get back lost data from Linux partitions. This tutorial will try to discuss how to recover lost Linux files and partitions on various storage devices. Linux data recovery mentioned in this guide refers to the process of recover lost files or partitions from Linux Ext4/3/2 disks. Before we get started, some points should be noted. First and foremost, Linux disk data recovery is not guaranteed to be 100 success rate. As we all know, data recovery cannot get back lost files which have been overwritten. Thus, you should try your best to protect lost data against overwriting; otherwise, there is great chance that you cannot successfully recover lost data even though you've followed the guide correct and used effective recovery software. Second, do not try any unproved approaches you find out online, especially when you are not experienced user to Linux drive data recovery process. That's because some method is likely to damage or even ruin lost data. Last but not least, if the device from which you want to recover data is physically damaged, you may need to send it to professional recovery center, for guides in this article mainly works on logical problems. Data recovery software is designed to scan storage device for lost data, for instance deleted files and partitions. Once a file gets deleted from Linux drive, it is not immediately overwritten, the space taken by deleted data is tagged by system as free, so that new files can be stored there. Lost files are recoverable as long the space does not get overwritten. Lost partitions can also be restored with Linux data recovery software. Partitions may gets lost due to deletion, partition table corruption, system crash, disk failure, etc. Recovery software can search the disk and identify lost partitions directly, after which lost partitions can be restored to partition table directly. Since distributions of Linux uses a wide range of file systems such as FAT32, Ext2, Ext3 and Ext4, the data recovery software should support recovering data from these drives. If the software you use cannot run on Linux operating system, it should at least be able to retrieve data from Linux partition. 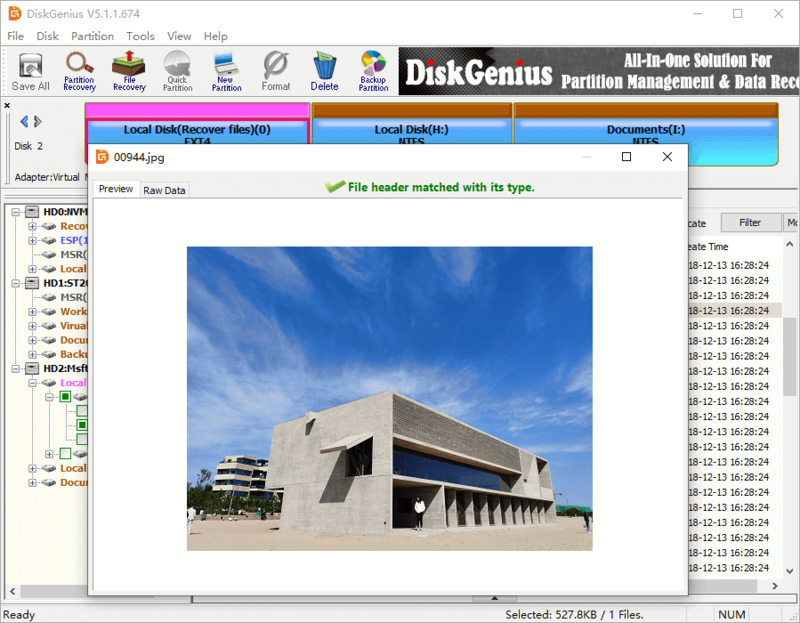 DiskGenius, effective data recovery & disk partition software, currently runs on Windows system and does not compile a version to be running on Linux. However, it is still an excellent Linux disk data recovery application. You can connect the disk or any other data storage devices where Linux data was lost to Windows computer with DiskGenius installed. Then, once the disk is recognized by the software, you can start recovery process. DiskGenius is designed with a user-friendly interface which makes the recovery is quite easy. It supports file recovery & partition recovery from FAT32/exFAT/NTFS/EXT2/EXT3/EXT4 disks; besides, the it works on a wide variety of storage devices, including hard drive, memory card, external hard disk, USB flash drive, pen drive, virtual disk, etc. 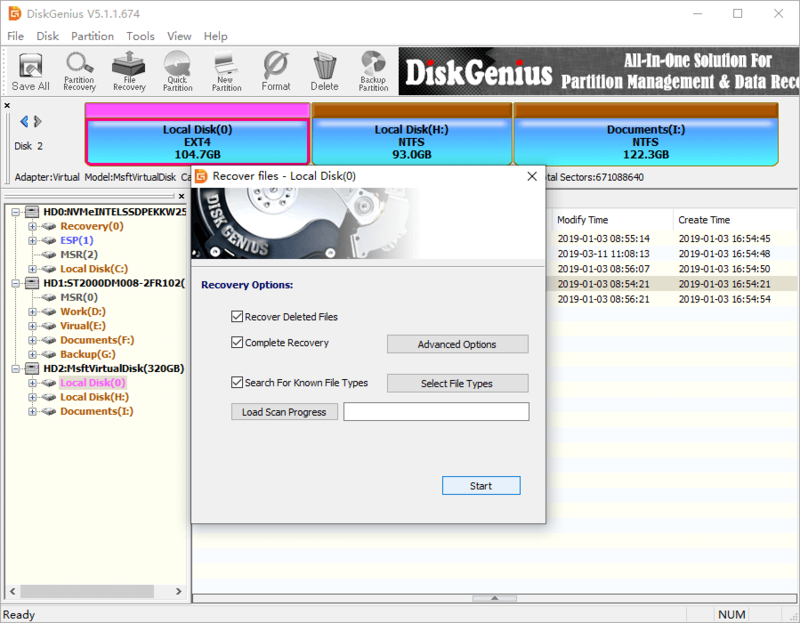 Apart from data recovery, DiskGenius is able a great tool to manage Ext2, Ext3 and Ext4 in Windows, for instance, format Ext4, create/delete/resize/clone/backup/read/write Ext4 partition, etc. 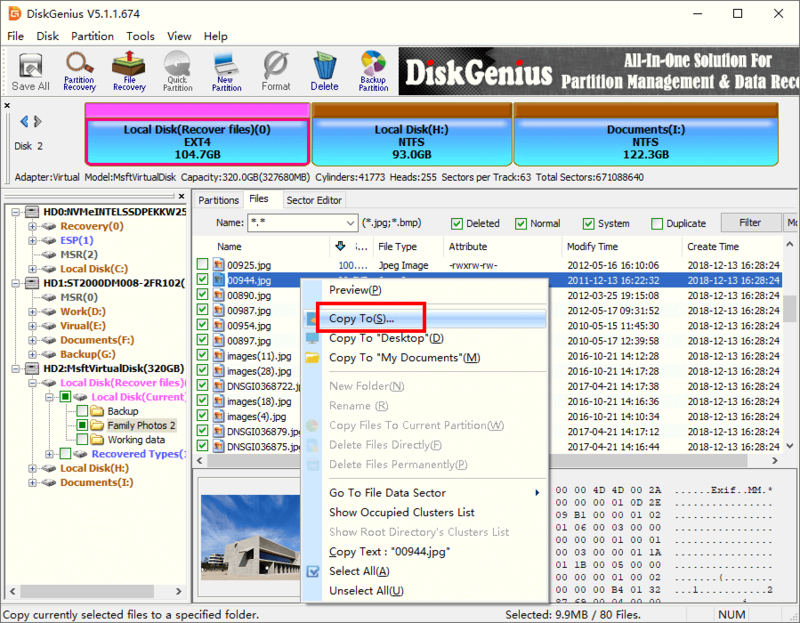 In this example, we use DiskGenius to recover deleted/lost files from an EXT4 partition. In general, a disk can be divided into several partitions and it is common to format partitions into different file system so that you can use the disk under different OS platforms. Connect the disk to Windows computer which installs DiskGenius, and we can get started. 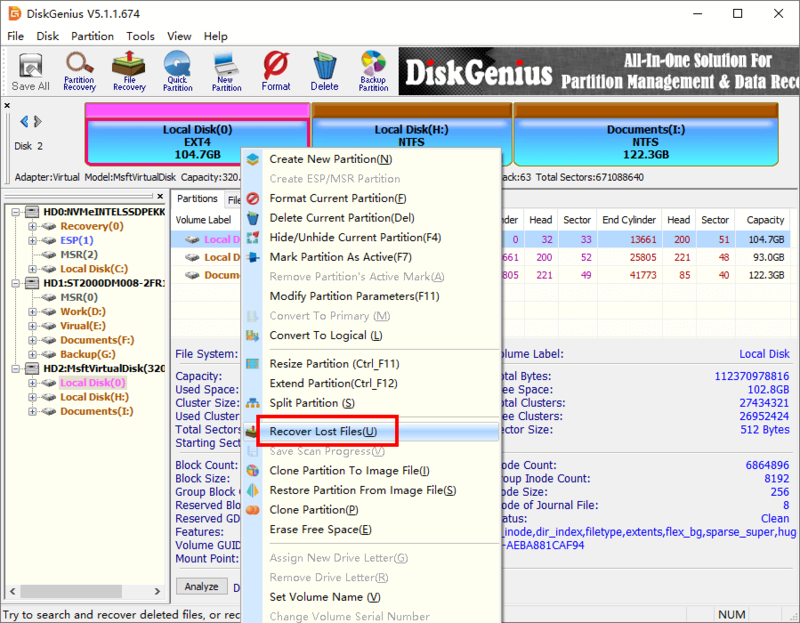 Step 1 Launch DiskGenius, right-click on the ext4 partition and choose Recover Lost Files. In the screenshot below, there is an ext4 partition on HD2 and it contains lost files. To recover data from it, you can also select the drive and click File Recovery. Step 2 Select recovery mode and click Start button to let scanning process work. DiskGenius provides two recovery options: Recover Deleted Files and Complete Recovery. It is recommended to select both options if you are not sure how your data get lost. Besides, the option to search for known file types should be selected at the same time, for it is deep scanning option and helps to find more data. Step 3 Preview recoverable files. Lost files and folders are listed in the scanning result, and you can preview files to find out what you need and check if files are damaged. Double-click on a file and you can view it in the previewing window, as follows. In this way, you can evaluate the software and make sure whether your data can be recovered correctly prior to purchasing a license code. Step 4 Recover files from Ext4 drive. Choose files and folders you want to restore from this Ext4 partition, and save them to another partition: right-click on selected file and choose Copy To. Partitions may get lost due to accidental deletion, partition table corruption, disk failure, etc. Once a partition gets lost, files and folders in the partition also become unavailable. In this section, we are going to use DiskGenius to restore lost partitions from an empty disk whose partition had been deleted. Before the deletion, there were 3 partitions on the disk, Ext4 partition, NTFS and Ext4 partition in sequence. Connect the disk to your computer and we can start lost partition recovery. 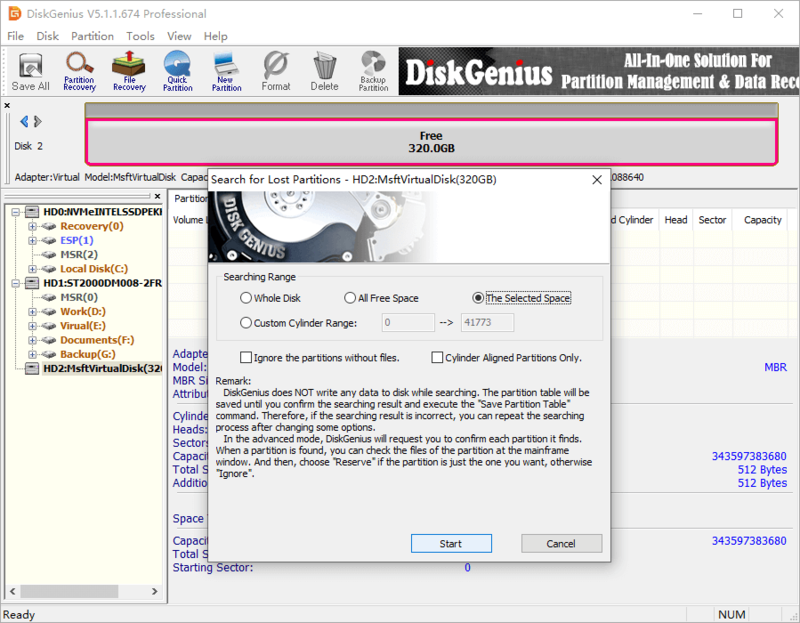 Step 1 In DiskGenius, select the disk to be recovered and click Tools -> Search Lost Partition (Partition Recovery). Also, you can just click Partition Recovery button from toolbar after selecting the empty disk from which you want to recover lost or deleted partition. Step 2 Select searching range and click Start button. From the pop-up window, you can choose searching range among Whole Disk, All Free Space and The Selected Space. If you are advanced user, you can custom cylinder range for partition searching. If you are not sure which one should be chosen, then follow the default setting. Step 3 Reserve partitions you want to restore and Ignore wrong partitions. Once a partition is found by DiskGenius, you need to Reserve or Ignore it, and you can easily make the choice by previewing files in the partition. 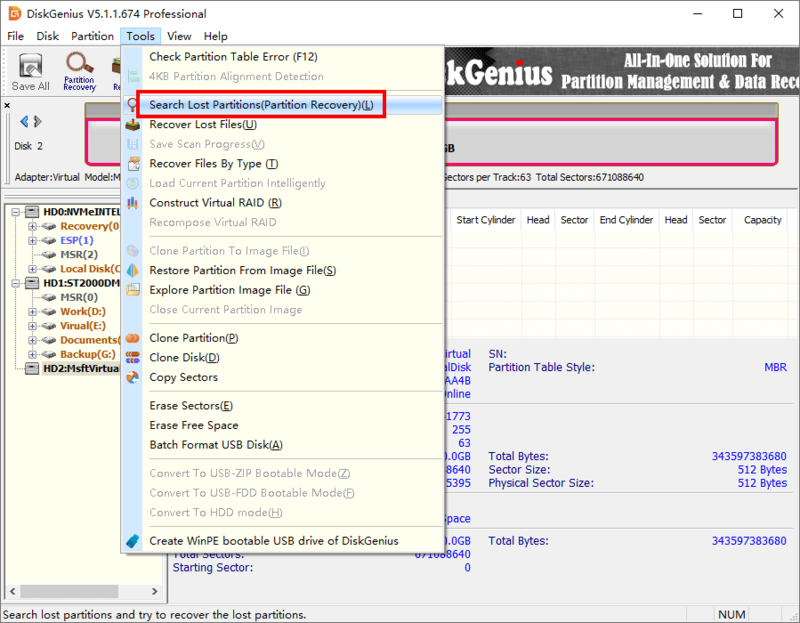 Once the partition is Reserved or Ignored, DiskGenius continues to search for lost partitions. Repeat the operation until the application completes scanning. Click OK when DiskGenius finishes partition scanning. Step 4 Click Disk – Save Partition Table to save lost partition to partition table. Partitions reserved in previous step won't be restored if you do not save partition, for they are just reserved to memory for the moment. Once partition table is saved, you can view them as normal partitions on the disk. Stop using the disk at once when you realize important data gets lost. Do not write any data to the disk, nor running any program that may access this disk. You can shut down system and connect the disk a different machine to perform data recovery. You should keep calm. Since you are aware of data loss issue, you should be rational when making any decision. For instance, do not try any solutions that you are not sure the outcome. Do not try any disk repairing actions, which includes but not limited to disk defragmentation, check or repairing files system errors, repair bad sectors, cleanups, formatting or anything might cause write action to the disk in question. Choose effective and reliable data recovery software. The recovery software plays important role in the recovery process and it should be efficient and workable on your case. It'll be helpful to read instructions prior to recovery task. In this tutorial, we've discussed approaches to recover lost files from Linux Ex4 partition as well as restore lost Ext4 partition in Windows 10/8/7. All guides covered in this article are easy to follow and novice users are able to try the recovery task on their own. Though DiskGenius cannot run under Linux, it is still able to recover data from Linux disk. Should you have any questions or requests, please do not hesitate to contact us. DiskGenius - Powerful data recovery software for Linux file recovery and partition recovery in Windows 10.